Healthy Together Geelong and the City of Greater Geelong have joined forces to provide healthier foods and drinks at the Lara Pool kiosk. This has included making healthy changes to the kiosk menu and promoting healthy options to users and visitors. Healthy Together Geelong compared the kiosk menu against the recommendations in the Healthy Choices guidelines*. Most foods and drinks sold were in the unhealthiest, RED, category. The drinks fridge was full of sugary drinks like soft drinks and flavoured waters, and unhealthy snacks were displayed on the counter. A plan was made to trial a healthier menu with only GREEN and AMBER choices, and no RED items at all. To develop the new menu and source healthier produce, Healthy Together Geelong collaborated with the Victorian School Canteen Association, the Healthy Eating Advisory Service and local food and drink suppliers. Buyers guides were used to select GREEN and AMBER products. A new bench top fridge was purchased to stock a range of fresh GREEN and AMBER choices such as sandwiches, wraps, cheese and crackers, yoghurt, fruit tubs, sushi and fruit juice. A bench top stand was purchased to stock healthier GREEN and AMBER snacks. Originally a branded awning was positioned above the kiosk counter and all advertising in the kiosk was for RED foods and drinks. To encourage community involvement, Healthy Together Geelong invited local kindergartens, schools and families to participate the Lara Pool School Project. Children were asked ‘What does health mean to you?’ and were encouraged to submit ideas for a new canteen name and other resources (e.g. graphics and designs) to promote healthy messages around the kiosk and pool. Around 60 submissions were made and marketing materials using the simple slogan ‘Hungry? Thirsty? Need Energy? Choose Green’ were developed. These were positioned around the kiosk to encourage users to purchase healthier choices. Support was provided to kiosk staff, especially during the transition of the kiosk menu. Staff training was carried out, focusing on how to stock the new shelves and fridges and how to market and promote the new healthy menu. Additional support was available via meetings, site visits and email and telephone advice. 24% of respondents visited the pool more frequently than the previous season. Respondents also demonstrated a high level of ownership over the changes made. As the 2013-14 season progressed and the kiosk increased stock and promotion of healthier items, there was an increase in sales turnover (Table 1). the summer of 2013-14 was not particularly hot, especially during the months of November 2013 and March 2014. On very hot days sales at the kiosk increase dramatically. 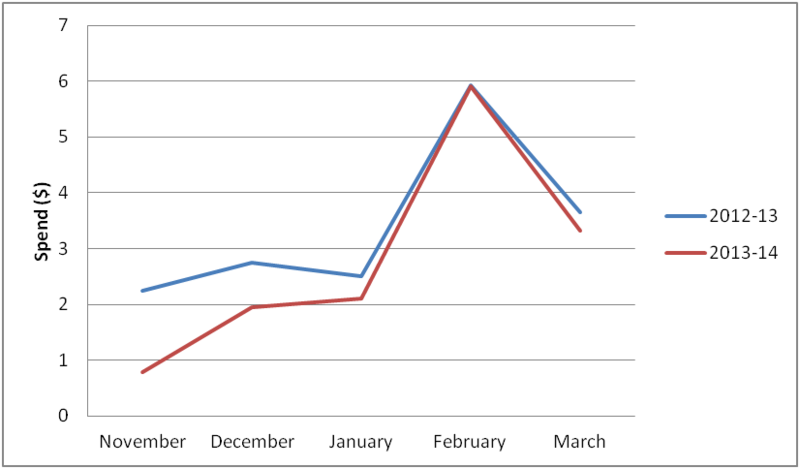 Despite a reduction in overall sales turnover in 2013-14, by mid-January, spend per attendee was comparable between the two seasons (Figure 1). It is likely that in coming seasons, as familiarity with the healthier menu increases, sales will continue to increase. This indicates that a healthier menu with only GREEN and AMBER products is a financially viable option for a recreation centre kiosk and is likely to have comparable turnover to a menu with predominantly RED choices. Healthy changes in the Lara Pool kiosk menu resulted in a 45% reduction in energy (kilojoules) and a 72% reduction in saturated fat provided to customers during the 2013/14 season compared to the 2012/13 season (Table 2). This will likely have a positive impact on the health and wellbeing of community visitors purchasing foods and drinks from the pool kiosk. 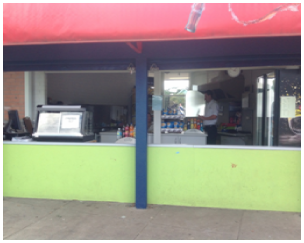 The Lara Pool kiosk now serves foods and drinks in line with the Healthy Choices guidelines. No RED items are for sale, and only products from the GREEN and AMBER categories are available. Promotion of unhealthy choices has been removed. All signage and promotional material in the kiosk and around the pool encourage healthier choices. Lara Pool management has committed to providing a menu in line with the Healthy Choices guidelines for a minimum of 3 years. Kiosk managers at other council-run recreation centres are investigating opportunities to make their menus healthier due to the success of the Lara Pool healthy kiosk. A list of healthier foods and drinks and suppliers of healthier options has been provided to interested outlets. Increased awareness of healthier food and drink choices has occurred in local distributors who have been involved in sourcing GREEN and AMBER products to meet the requirements of a healthier menu. Turnover of sales from the 2013-2014 season demonstrates that a healthier menu is financially viable for a recreation centre kiosk. Many healthy products sell equally as well as the unhealthy products. Introducing all new healthier menu items at the start of the season will likely improve sales outcomes. Promotion of healthy products (e.g. by sales staff, A-frames) strongly impacts the sale of these items. Regular support, education and encouragement for kiosk staff reinforces positive attitudes toward a healthy menu and this can impact sales. Engaging the community in the implementation of healthy changes encourages community acceptance and satisfaction. This increases the chances that healthy changes will be maintained. Including GREEN, AMBER, RED product classification on food and drink distributor catalogues would assist food outlets to implement a healthier menu. Buyers guides for school canteens (e.g. Healthy Kids and FOCiS) can help food outlets source healthier products. Modifying facilities at a venue may require further considerations such as risk assessment, as proposed modifications may not meet current guidelines and requirements. For example, new chairs, sun shades and images on concrete grounds were not installed at Lara Pool due to council risk management regulations. Significant changes to the kiosk brand (e.g. the name of the kiosk) may require collaboration with local council. 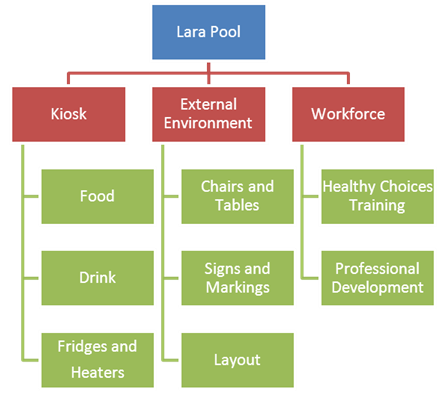 The Lara Pool kiosk was not renamed due to potential dilution of current council branding across recreation centres. The likelihood of implementing long term healthy changes is enhanced by working at a systems level. Changes to the Lara Pool kiosk were supported by working with council, local community and food and drink suppliers. Demonstrating the practical and financial viability of a canteen that only serves healthier choices can influence perceptions, attitudes and beliefs around the risk of removing RED items from retail outlet menus. Healthy Together Geelong, funded by the Victorian Government, is improving the health of our community.